We spoke with BrightSource CEO John Woolard earlier this week about CSP economics and the newly announced molten-salt storage technology that BrightSource will incorporate into its concentrated solar power systems. Woolard hinted that there were more and bigger announcements to come. We didn't expect them to come so soon. The soon-to-IPO mega-startup just filed a license application with the California Energy Commission (CEC) for the 500-megawatt Hidden Hills Solar Electric Generating System (HHSEGS). For the updated GTM CSP Project Tracker (list of all 40+ CSP projects in the US) - click here for a 2-page document with a detailed map and spreadsheet. Woolard told Greentech Media that BrightSource's next generation of plants will be much larger, thereby improving efficiency, lowering cost-per-watt, and bringing down LCOE. The firm is raising the power of their modular field from 130 megawatts (like at Ivanpah) to 250 megawatts at future deployments. This helps the economics, as doubling the capacity only increases the power block costs by 40 percent. BrightSource is also increasing the height of the central power tower from about 450 feet tall to a massive 750 feet high. That's amazingly tall, but not yet in the Enviromission category. The increased height "allows the heliostat rows to be placed closer together, with the mirrors at a steeper angle. This substantially reduces mirror shading and allows more heliostats to be placed per acre. More megawatts can be generated per acre and the design is more efficient overall," according to the license application. A spokesperson at BrightSource claimed that the new design was "far more land-efficient because we can concentrate more heliostats in a smaller area of land. We estimate that Hidden Hills uses about one-third less land than competing PV and trough plant in energy production (acres per megawatt-hour)." According to the CEC filing, "HHSEGS will be located on approximately 3,277 acres (5.12 square miles) of privately owned land in Inyo County, California, adjacent to the Nevada border. 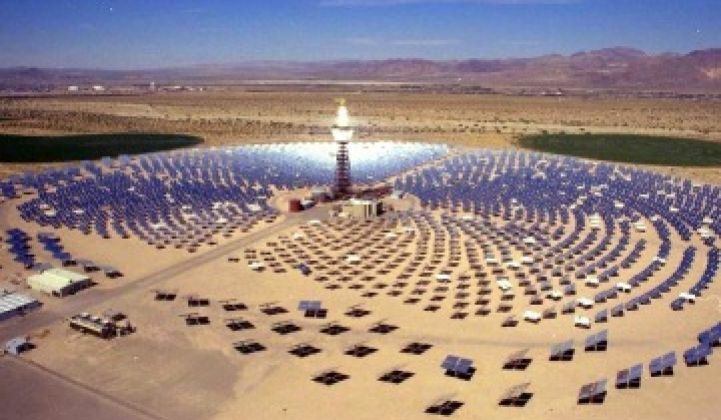 The project site is approximately 18 miles south of Pahrump, Nevada, and approximately 45 miles west of Las Vegas, Nevada." BrightSource is supposedly in its pre-IPO "quiet period" but being anything but quiet. Unlike the Ivanpah project, HHSEGS will have to be financed without the benefit of DOE loan guarantees. And unlike the Ivanpah project, Hidden Hills will be on private land, potentially decreasing the tortoise-intensity of the project.